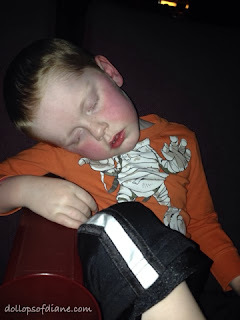 Dollops of Diane: A Day at the Movies: The Lego Movie! A Day at the Movies: The Lego Movie! We wanted to try to squeeze in some fun before (yet another) snowstorm hit hard today so we headed to the movies. We've actually never taken Daniel (age 3.5) to the movies before because he's not the kind of kid who can sit still for long. He can't last a whole movie at home but since the hubs and I were both looking to get out we decided to give it a go. The no frills theater around the corner from us offers $6 matinees so it's not TOO bank breaking for this family of five to attend. I also figured we could tag team it if one of us needed to leave the theater with him for a bit. Even our big kids (ages 6 and 5) have been to less than a handful of movies so it's still a big deal for them. We arrived at The Lego Movie and the kids were psyched. We got a large popcorn that they surprisingly did a great job with sharing. Daniel totally pigged out on it, talked loudly for a bit, and then passed out. I'm not going to lie, I was pretty pumped when he fell asleep. It meant I could actually relax and not have to worry about him. So Daniel got a nap in and the rest of us got to enjoy the movie in peace. A total win/win! We are now home taking turns incessantly singing, "Everything is AWESOME!" and watching the snow fall. It's debatable what will drive us more insane - that song or the 8+ inches of snow in the forecast.